When I was pregnant with my second daughter, Kickee (nickname of course), I had this nightmare where I was Kickee, running through an empty field, lost under a thunderous skyline. I distinctly remember feeling the fear and shortness of breath as I ran, desperate to find my older sister Boo (also a nickname). I felt the panic rise in my chest as my head darted left and right, trying to find her. I could hear her giggle, but as I cried out to her, I realized she had abandoned me. I stopped as tears rolled down my cheeks, falling bitterly to the hard, soil covered earth below. I was all alone, and Boo was not coming for me. The most distinct memories I have as a kid are shared memories. I was not alone unless I really tried to be. (And by alone I mean hulled up in my top bunk with my makeshift shelf of books and possibly a Blow Pop or stick of gum.) There is a special kind of tug of war that plays out in the hearts of those of us lucky enough to have siblings to grow up with. My sister and I are no exception. On any given day we could be found fighting over a toy one minute, and then giggling hysterically over a private joke the next. We made up silly games that only we could understand the rules to. We cheered each other up, and put each other down. We played together, we shared stories and toys, and we snuck off with each other’s Halloween candy (or worked together to raid my Mom’s lingerie drawer chocolate stash). You get my point. Siblings are a special kind of friendship. You can’t escape each other, so you love each other no matter what. There’s no walking away from that relationship (at least as a kid) and no one else in the world will simply “get you” the way a sibling can. I pretty much had my dream figured out, at least to some extent by the time I woke up from it. I distinctly remember a handful of times when I was approaching my teenage years when my next door neighbor friend of ours, Jennifer (there’s always a Jennifer, isn’t there?) and I thought it was cool to try to ditch my sister while playing in the parking lot between our apartment buildings. It wasn’t that we didn’t like her, or that there was anything wrong with her. It was just that she was 2 years younger, and we were on our quest for independence. But I’m sure to my sister, it felt like a betrayal. Even though my sister and I have a great relationship, we have each other’s backs in everything, and we are generally very close, the memory still haunts me, because I am the Big Sister. I should have been there for her. I am the Rule Follower, and Path Finder and Way Maker. I had a responsibility to her, and I let her down. It was like a huge black smear across my Sister Record. I feared for Kickee because of that. I feared for her relationship with Boo. I feared for Boo, too. She is so like me in so many ways, and I don’t want to see her fail. She hates to fail. It crushes her when she does. What parent wants to see that? Flash forward to yesterday. Kickee and Boo were riding bikes and trikes in the parking lot near our apartment buildings with our neighbor’s kid, Anderson. Anderson is a great kid…but he’s 4. And 4 is as 4 does sometimes, right? Haha. Anyway, I was walking up the driveway when I heard Boo whimpering. “No, no! My Sissy!” She cried. 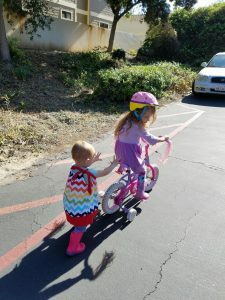 I looked over to where she was riding in time to see my her jump off her little training wheel bedazzled bike with pink sparkly streamers, and pry the pink bike helmet off of her curly little head, eyes flashing with concern and…anger? My eyes followed the path of her gaze to the lawn where I saw Kickee standing with Anderson. Anderson was trying to take away her little wooden trike, and Boo was looking ready to throw down over it! Anderson saw Boo, and immediately backed away from a bewildered and mildly confused Kickee, who then toddled off with her trike in tow, unaware that she had possibly narrowly missed witnessing a great fight waged in her honor. A fierce feeling of warmth and pride filled my heart as the tears started to brim in my eyes. The fiery and unmatched sisterly love my little 4 year old Boo Bear had just displayed in the face of adversity toward her baby sister left me floored. Every fear I had left residually stashed in the corner of my heart from my Kickee nightmare vanished in an instant. After checking on Kickee, I walked over to Boo, who was back on her bike, enjoying the afternoon sun. I told her how proud I was of her. I told her how important it was to always look out for your sister, and how she was such a good girl. I explained to her that no other relationship in the world will ever be the same as the one she has with Kickee. I told her to always do what she had just done: Stand up for her sister no matter what. Because that’s what sisters are for. 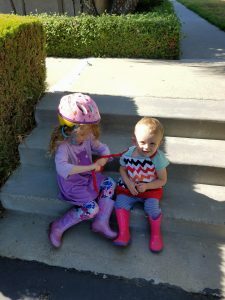 This entry was posted in Bethany, Hayley, Motherhood and tagged Family, Friendship, Kickee and the Boo, Sisterly Love, Sisters on June 29, 2018 by cslyngman. Hi, I’m Christin! I am a wife, mother, believer, and seeker of wisdom and wellness, who also bakes a lot of chocolate chip cookies. Why? Because finding balance and joy are important…and nourishing in many ways! As a busy, hard-working mama who also works full time, I find it challenging to truly connect with others and share our experiences. 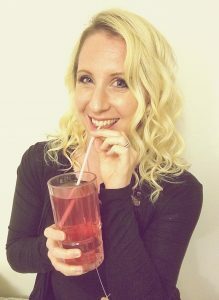 Through this blog, I am making a deliberate choice to live each day with intention. With enthusiasm. With JOY! I invite you to join me on this journey and to leave feeling nourished by joy.